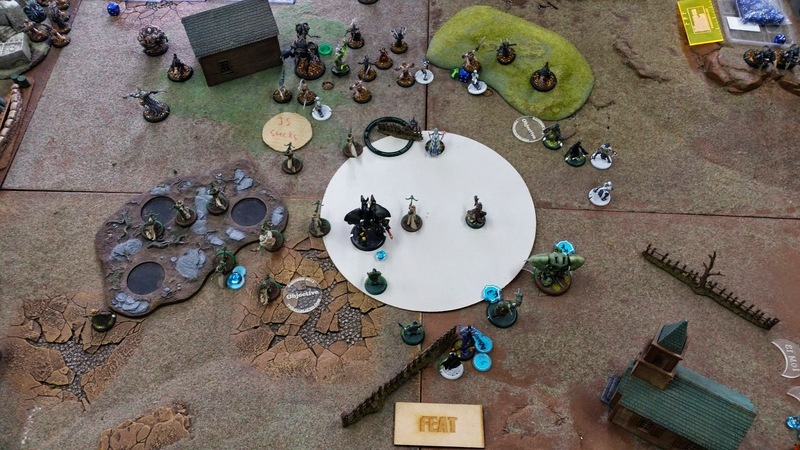 Retribution of Cyryst: Issyria vs pAsphyxious 50points batrep. Here is some random Japanese picture to add flavor. Fortune favors the air conditioned hobby store. Hurray for war gaming in Japan. As I slowly get acquainted with the community I learn a little of the nuances of war gaming life. Such as it's almost un heard of to have a table and terrain in your own home. Also you always pay for the use of rental tables. Also you can book these tables ahead of time. So one such new acquaintance a Spanish expatriate Carlos contacted me for a game over the weekend. At first I couldn't accommodate, but then we arranged a time and set out for my LGS Arrows. Arrows is great, in the heart of this sweltering city where the thunderstorms last 6 hours and its 30 degrees into the deep night, the small but air conditioned shop with excellent tables friendly staff and decent stock is the best a war gamer could ask for. We arrive right on time and head up to pay for a table to which the response is. 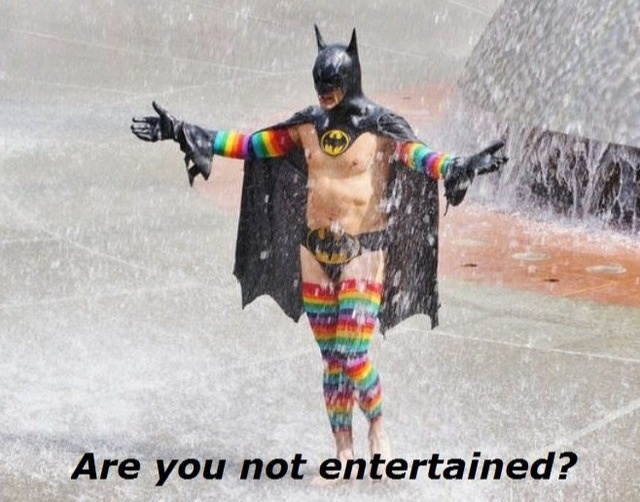 "Do you have a booking" to which our response is "... wot?" Anyway we spent about an hour checking out spots in Akihabara for a place to play, return to Arrows and sweet talked the store manager into letting us use a table for just one game. He wins dice and chooses second. Some crab jack with a row 3 pow 15 gun that puts Ret jacks to shame. Issyria Inviolable Resolves the Strike Force. Discordia imprints and runs to try and save 3yriss from the near certain aoes coming her way. This is quite an interesting match up. While it's probably the last time I turn Infiltrators with Issyria they still had plenty of spell caster targets to go for, and not much spam so lots of charge lanes. The Strike Force also had plenty of light jacks to mess up. However from his side he had nice big fat aoes to drop on everything and of course his feat, power 5s for everyone, yay. 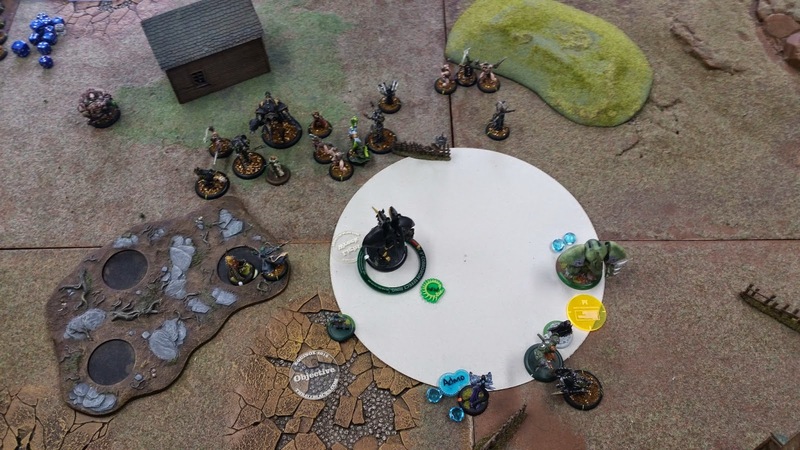 Saxon advances and shoots an Infiltrator with his Lucky Bow. A couple of corrosive mist clouds go down and his army shambles into position. The machine wraith on the right flank runs up and engages an Infiltrator. Pistol wraith on the left kills a Mage Hunter. The wayward aoes drifting about were quite worry some, however there must have been a favorable wind. I'm not sure if this should have been the feat turn, but it was. I think my plan was to take out all his stealth stuff with shooting. Discordia activates, positions to not block a charge lane for Eyriss and then sprays down a mech thrall. The plan being now to activate Issyria, ancillary attack spray over my Infiltrator engaged with the machine wraith and use the feat to let me hit and miss the right targets. Issyria activates and feats. Casts admonition on herself and ancillary attacks Discordia. Which misses the machine wraith and the Infiltrator. She then casts crusaders call and laments. 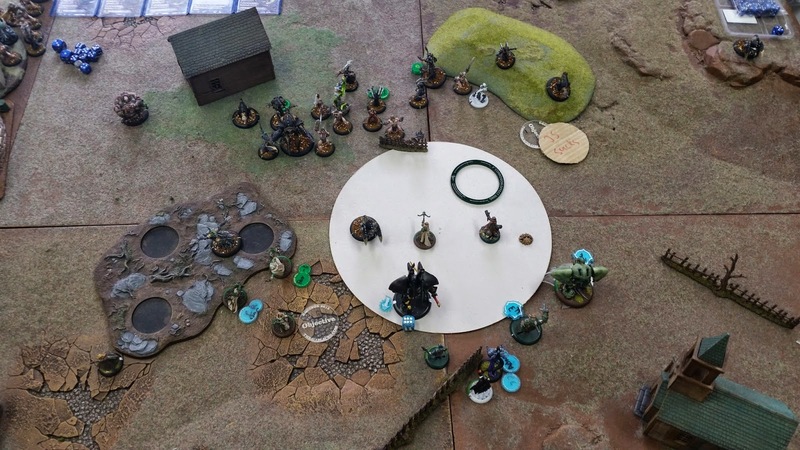 The Mage Hunter Assassins activate, the first charges Saxon Orrick and pink mists him. The second charges the death ripper and is 1/4 inch out of range. The Infiltrators go next, 3yriss leads the charge on a mech thrall. From this she quick works a shot into the bile thrall and pops it. One Infiltrator runs through the machine wraith triggering a free Strike which it takes, then the 2 further behind charge into it and kill it. The others skirmish into the Cryx front line, killing a Cephalyx and a couple more thralls. Then the Strike Force open up on the left flank. 3 Mage hunters hit and put about 12 damage on the death ripper. The rest fire on to the crab jack and despite the feat only about half hit, taking off its right arm. 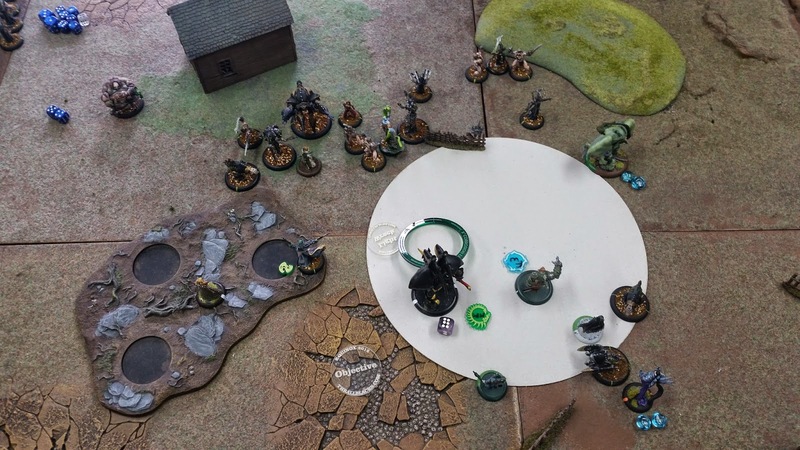 Lanyssa ambles around the edge of the forest and ice bolts the lone pistol wraith. A pretty bad feat turn all over, the Phoenix tried to shoot at the clump of thralls with Madelin and missed everything. Hell diver on the left pops up and slams the Phoenix knocking it over the Arcanist, killing him and knocking the Phoenix down. The marshaled jack puts 3 shots on the Phoenix with help from the Overseer and the war Witch. This drops it's shield and does about 4 damage on its grid. I don't remember the activation order, but Gasp feats and kills a handful of Mage Hunters. Well placed corrosive mists clear out some more and my Mage hunter assassins. Elfelyn senses the time of action is nigh, then remembers it doesn't work like that. With Admonition up Issyria leaves the comfort of her fence to dominate the zone. 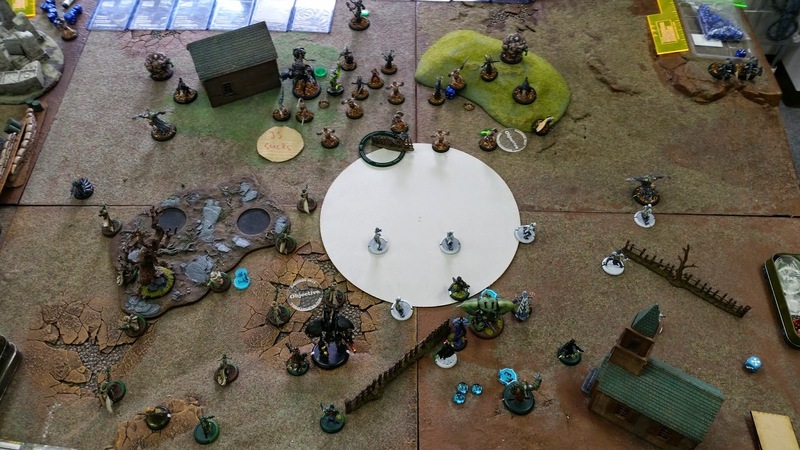 Lanyssa advances into the forest and tries to Ice Bolt the Machine wraith but misses. I tried to Intrigue Discordia with Elfylyn and then my opponent pointed out I was cheating. So Discordia just charged the objective and killed it. An ancillary attack happened somewhere and did nothing as far as I know. The Mage Hunters charged the crab jack and still couldn't kill it. However it didn't matter as I had now for all intents cleared the zone, killed the objective and scored 3 points. Asphyxious was in the kill box and was looking for a good way to get out, charging Discordia seemed decent. After which he teleported to the safety of the fence. Asphyxious didn't do much damage to Discordia. 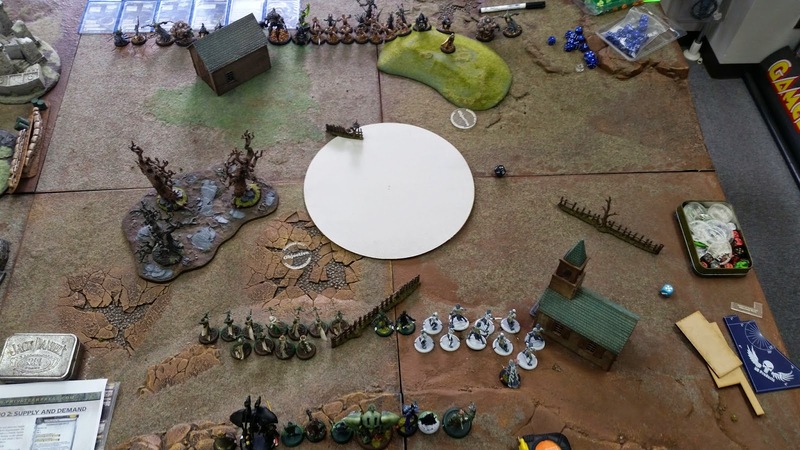 One deathripper came barelling down off the hill but then didn't arc any spells. 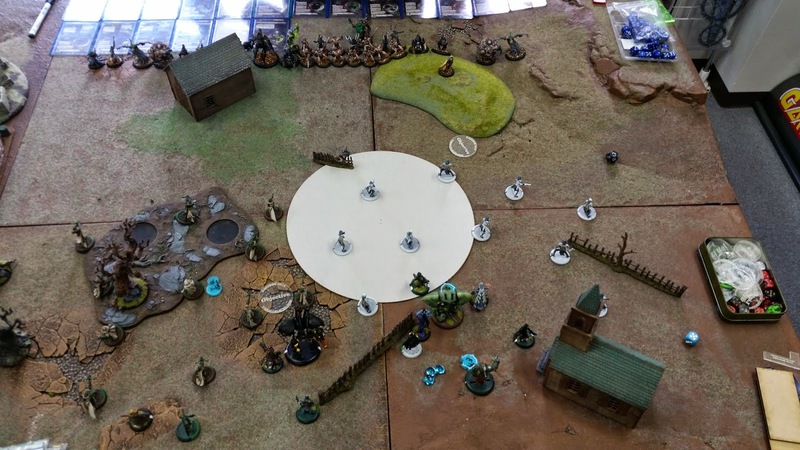 The crab jack and thralls mop up most of the Mage Hunters but forget to contest the zone. The Hell Diver pops up but can't pin down Issyria with Admonition up. However the second machine wraith happily walks away from Lanyssa and her magical sword and inhabits my Phoenix. 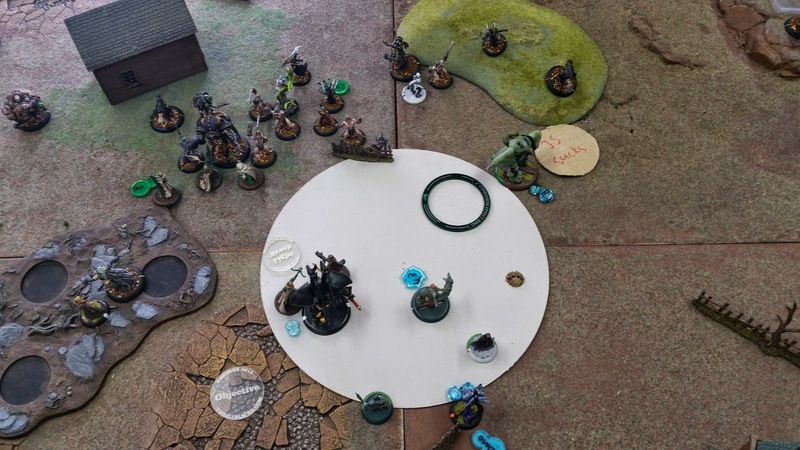 Thankfully Issyria is an eight focus caster so she could mind wrestle the wraith out of my Phoenix, who which with some Arcanist focus goes and kills it. And Issyria wins on scenario.